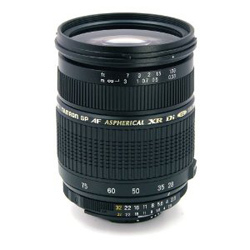 About.com has reviewed a mid-range zoom lens from Tamron that can be used for Canon, Nikon, Pentax and Sony cameras. The Tamron lens has a fast F/2.8 constant aperture that is useful and it also features compact size and non-rotating internal-focus (IF). About.com ends up giving the Tamron SP AF 28-75mm f2.8 a very good review with an overall rating of 4.5 stars out of 5 possible. The reviewer finds the lens to be fast, has good auto focus and the f2.8 aperture is useful. There are some negative sides including corner softness and reports of inconsistency between individual lenses. Overall this Tamron lens has got a lot to offer, especially if you at the price tag. Read the full review of the Tamron SP AF 28-75mm f2.8 XR Di LD Aspherical (IF) lens here.